To Mars and back on a 50-kilogram tank and more fuel-efficient than NASA: that's the aim of Sydney rocket scientist Paddy Neumann for his prototype ion drive. And Dr Neumann has just signed a deal with Europe's biggest aerospace company, Airbus Defence & Space, that will take his design to be tested at the International Space Station. Dr Neumann, 32, has been working on a type of rocket for space travel that he says has potential for use in Mars settlement, deep solar system exploration or in orbital adjustment for satellites. The University of Sydney graduate is in Mexico this week at the International Astronautical Congress, presenting a paper on his design. Airbus will also present, outlining their collaboration, for which Dr Neumann's company, Neumann Space, will pay Airbus. Elon Musk outlined an audacious plan for settling Mars at the congress this week. An ion drive moves a craft through the vacuum of space by using a magnetic field to eject ionised, or electrically charged, particles at high velocity instead of using the chemical fuel burn of a traditional rocket. 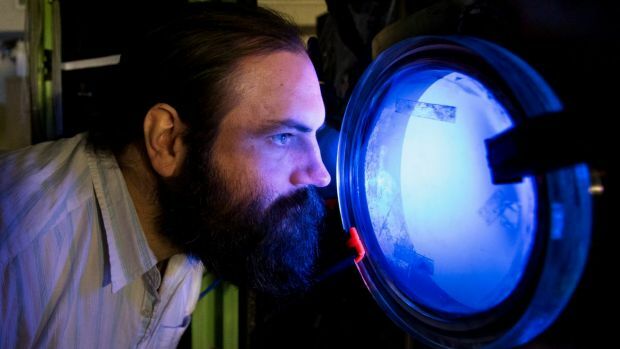 "It works kind of like an arc welder," Dr Neumann said. "It throws out metallic ions at high speed and just like there is recoil when a bullet comes out of a gun, the recoil from the plasma moving away gives you thrust, which pushes your spaceship along." However, the thrust of a ion engine provides about the same force as that from a postage stamp against your skin. Gently blow against the palm of your hand and you'll get an idea of the amount of force involved. While a chemical rocket produces tonnes of thrust, it quickly burns its fuel. 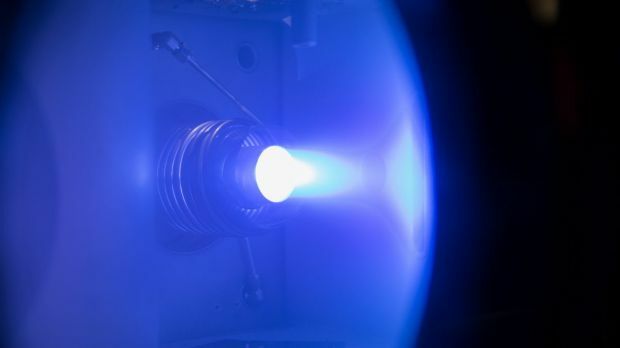 An ion engine can keep accelerating for days, months or even years after a chemical rocket has blasted its fuel away. In the frictionless vacuum of space, this adds up to huge velocities over time. "It's a classic tortoise over hare situation," Dr Neumann said. You need the thrust of chemical fuel to get into low Earth orbit, but from there, the next generation of space travel will likely rely on ion drives. Ion engines are not a new idea. The chief mission engineer of Deep Space 1, Marc Rayman, told The New York Times: "I first heard of ion propulsion in 1968 during a Star Trek episode." From the realm of science fiction, NASA now has used them in its Dawn mission to the asteroid belt and beyond. 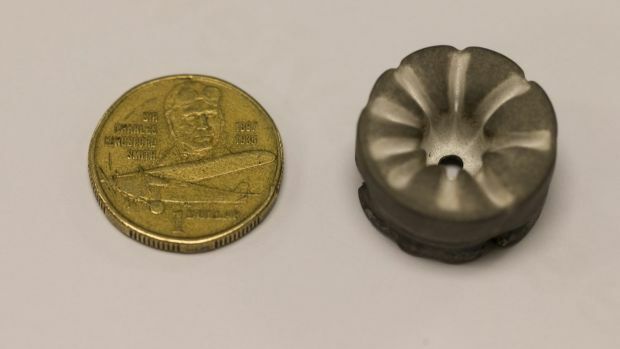 NASA's senior technologist in ion drive technology, Mike Patterson, told Fairfax Media that a new generation of ion engines was being developed by NASA. The so-called Neumann Drive has set a record high "specific impulse" for this type of engine. Specific impulse is a measurement of the fuel-mass to engine-thrust efficiency. However, Mr Patterson said: "There is no value, in and of itself, of achieving a 'world-record-specific impulse'." Mr Patterson is developing the NASA Evolutionary Xenon Thruster, or NEXT. He said: "Maximising specific impulse irrespective of other considerations doesn't make any sense. And he would know that." But Dr Neumann said that was the case if your craft didn't have to come back. Having ion drives at high specific impulse would be useful for missions to multiple asteroids where you wanted to return samples. The NASA technologist raised questions about another vital factor – energy efficiency. Mr Patterson said the Neumann Drive had "less than half the efficiency of NASA's NEXT thruster". Dr Neumann said: "We accept that our current energy efficiency is less than that of xenon-fuelled thrusters, and have ideas on how to improve it with further magnetic nozzle development." He also said improved solar panel technology would assist, leading to higher power levels. But Mr Patterson told Fairfax Media: "If both technologies can run at the same specific impulse, which one would you pick? The one that has four times the efficiency or the one that has a quarter the efficiency?" However, Mr Patterson said Dr Neumann's work was "laudable" and wished him continued success. "The potential advantage of his concept is that it is multi-propellant capable," Mr Patterson said. What's different about the Neumann Drive is it uses small solid fuel rods of common materials rather than rare gases, such as xenon. The Neumann Drive has been tested using a variety of solid fuels: carbon, aluminium, magnesium, titanium, molybdenum, tin. In his paper published last month in Applied Physics Letters, Dr Neumann explains how solid magnesium fuel provides the best performance. A further advantage with magnesium, Dr Neumann said, was "its abundance in asteroidal material and in space junk, providing an opportunity for utilising these resources in space" for fuel. Dr Neumann's co-author, Professor David McKenzie, said: "It is possible to send missions to Mars, have them perform experiments and then bring the spacecraft back to Earth orbit without needing to refuel." Dr Neumann's PhD supervisor, Professor Marcela Bilek, said: "It is exciting to see our ideas being turned into devices that can be exploited in the real world." A spokesman for Airbus Space & Defence said: "Airbus Defence & Space and Neumann Space have signed a commercial contract to fly a payload to the ISS and operate it there for at least one year with the option to extend the mission. This is a commercial activity for which Neumann Space pays Airbus Defence & Space." The technology could be used to power a return trip to Mars without refuelling, and use recycled space junk for the fuel. Former University of Sydney student, Dr Paddy Neumann — now of Neumann Space — and two co-inventor professors from his alma mater have developed an ion thruster that could replace the current chemical-based rocket propulsion technology, which requires huge volumes of fuel to be loaded onto a spacecraft. 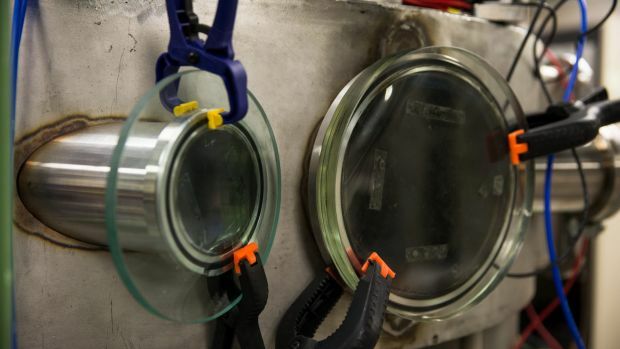 Professor Marcela Bilek, one of the co-inventors, said they built a system in the early 2000s that was a "cathodic arc pulsed with a centre trigger and high ionisation flux". At that stage of the project, it was basically a machine the size of a fist that spat ions from a very hot plasma ball through a magnetic nozzle at a very high velocity. Professor Bilek explained a cathodic arc was a system that used solid fuels — metals — and worked similar to a welding arc. "Where you're ablating the material from the solid and turning it into what's called a plasma — the sort of stuff you see in the sun," she said. "And it's ionised, and that enables it to have high energy." She said that prior to Dr Neumann joining them, the technology was used for thin films, and Dr Neumann had wanted to see whether they could use the technology to turn it into thrusters. 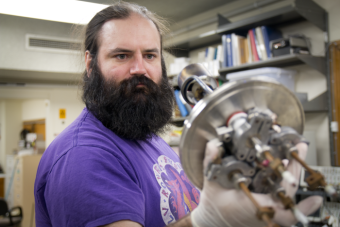 "Just because it spits out these particles at very high velocities," Professor Bilek said. 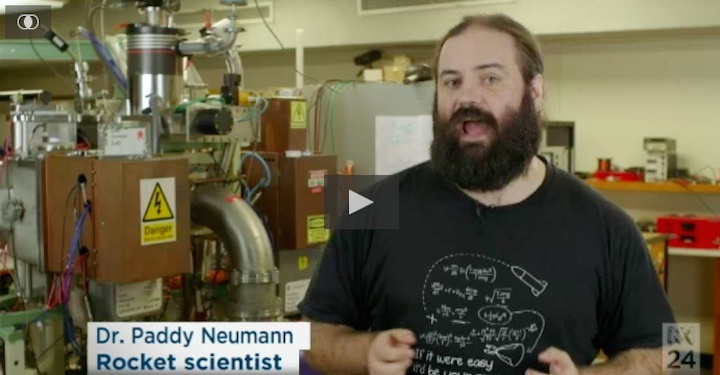 Dr Neumann said he first became interested in the technology when he was a third-year physics and engineering student at the University of Sydney. He became interested in a special research project that the plasma physics department was doing, measuring the intensity of electric and magnetic fields during the pulse arc discharge. "I helped them build the probe that took these measurements," Dr Neumann said. "These measurements that I took suggested that the titanium ions, and the titanium plasma we made, were moving at about 23,000 kilometres per second, in the middle of a strong magnetic fields, so they would have had to slow down to get there. "The particles that come out of the back end of a hydrogen oxygen rocket, such as what was used to power the space shuttle, they move at about 4.5 kilometres per second. "So this made me think that you could use the pulse arc as a really efficient rocket thruster." The technology also uses recycled space junk, making it an environmentally aware project. Professor Bilek said magnesium came out on top in their tests as the fuel with the highest specific impulse, and so the most fuel efficient. "Magnesium happens to be a light metal, which is very abundant in aerospace materials," she said. "So all of that space junk that people have been talking about that's causing us a problem now with satellites in Earth orbit, is up there and available for recycling." Professor Bilek said the next step for the Australian inventors was getting their technology to the International Space Station — possibly by the end of 2018. "We've been testing on Earth in a vacuum system to simulate space, but it's a small vacuum system, so this will be the first real test of a true space environment with on-board monitoring of the system." It will be placed in a module outside the ISS, powered, as Dr Neumann describes, by an extension cord from the station. "What we'll be doing with our system is running it for as long as we can, hopefully for the entire year on the space station to measure how much force its producing for how long," he said. "Are there any particular failure modes? Does it change its behaviour over time? Do we have any issues with environmental hazards? "So that we can tell potential customers and project partners that we have in fact tested our drive in space."